The International Space Station (ISS) is about to take delivery of a couple of robotic “bees” that will help take care of routine chores and also participate in experiments conducted by controllers on the ground. Dubbed “Astrobee,” the compact, cube-shaped flying robot has been developed and built at NASA’s Ames Research Center in California’s Silicon Valley, and two of them will be heading to the space station later this month. Several years in development, the 1-square-foot robot features an array of cameras and sensors for navigation, crew monitoring, sampling activities, logistics management, and other routine tasks. A touchscreen, speaker, and microphone are also part of the package, while its mechanical arm enables it to handle a variety of tools. Astrobee uses a fan-based propulsion system to move, and power comes via an onboard battery. When it starts to run low, the robot will automatically navigate to a nearby dock to recharge. NASA said it wants to use its Astrobees to learn more about how humans interact with robots over prolonged periods and in close proximity, adding that its research is key for future missions to the moon and beyond. Astrobee is capable of performing routine tasks, thereby freeing up time for astronauts engaged in research work. Meanwhile, controllers back on the ground will be able to fly around the station and inspect the surroundings through the Astrobee’s camera. “They can see and hear the station activities through the free-flyers’ microphone and cameras, monitor and conduct experiments, or oversee routine chores by remote control, almost like being there,” the space agency said. The Astrobees project builds on the success of SPHERES, NASA’s first-generation robotic assistant that arrived at the ISS in 2006. The new arrivals will also get to meet CIMON, an artificial intelligence robot developed by Airbus and Germany’s DLR space agency, and powered by IBM’s Watson supercomputer. 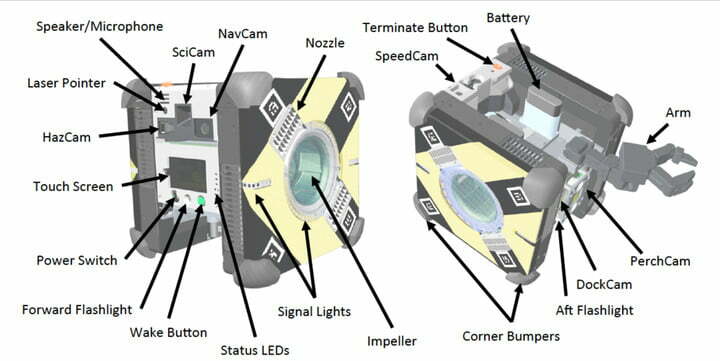 CIMON, which moves using fans in a similar way to the Astrobee, has been assisting the ISS crew with its research work since arriving there in 2018. Its artificial intelligence smarts enable CIMON to see, hear, talk, and comprehend, and the more it interacts with crew members, the more abilities it’s able to develop.